Dar Lighting Atlanta 2 light table lamp displays a classic candelabra style design with a slender, central stem and two sweeping arms that are topped with sconces and candle holders. A faceted lux crystal finial sits at the centre of the stem and completes the timeless look perfectly. The product code for this Dar table lamp is ATL4275. 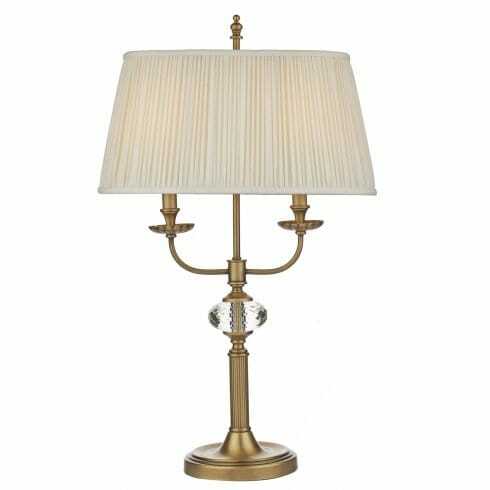 A beautiful table lamp that will compliment both modern and more traditional spaces. The matching mushroom coloured, faux silk pleated shade comes complete and compliments the luxurious pale brass finish. To extend the look throughout your home please see our website for the matching 6 and 12 light chandeliers and the two light wall fixture.